Flatastic premium responsive retina-ready multipurpose OpenCart theme. It was developed according the latest technologies and can be perfectly fit for any eCommerce website. It has so many features that are described below. - Image, video , table , text etc. Flatastic : Latest Products by category Isotope module. - Isotope plugin : Excellent effects. - List 5 product modules with Isotope. - Reflect your imagination to canvas. Endless features! Flatastic : 3 Column Products Carousel. - Has been designed specifically for home page 2 and 3 layout . - Unlimited categories , links et. Hundreds of options for each item. Size , color , font size etc. Selectable manufacturer option for each item. - 600+ Google webfonts and font option. - Responsive module options. All modules can hide in certain dimensions. Desktop , tablet , phone. All modules optional. - Module Ribbons : Separately for each module choices. Left or right ribbons. - Advanced maintenance page. You add image , html , countdown etc. - Extra features for success and error pages. - Custom CSS and JS area. - 4 type footer and header options. - Special 3 type homepage layout. Unlimited idea. - Effective product listing page. - Product Quick view on all products. - Unlimited extra product tab for each product. - Recently viewed module for product page on all position. - Extra shortcodes – Easy to use. 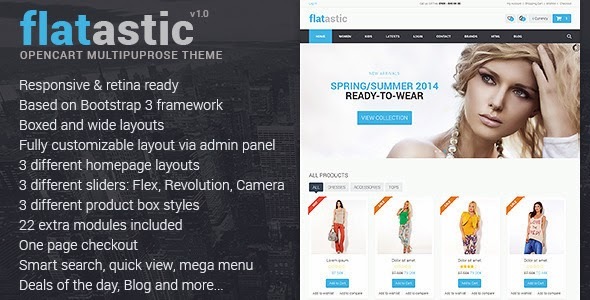 Item Reviewed: Flatastic Premium Multipurpose OpenCart Theme 9 out of 10 based on 10 ratings. 9 user reviews.